Whenever you advance Oaktown Renovation, gain 2credit (or 3credit if there are 5 or more advancement tokens on Oaktown Renovation). Players trying to use Oaktown Renovation as a money making device might be missing the most effective part of the ability- that it doesn't cost money to advance. This makes it ideally suited in Weyland rush builds, where agendas must be thrown out as soon as possible. How many times have you played a Weyland rush, where the runner forces you to rez remote ICE, and leaves you just a few credits short of advancing out your agenda? In this case, Oaktown is serving two purposes- funding its own advancement, and generating credits in the bank for the next agenda. An ideal play would be to Install-Advance-Advance, then the next turn Advance-Advance (score)- Install. Bonus points since that install is blank- is it a 3/2 Project Atlas? or just Jackson Howard, ready to power draw for the agendas you don't have yet? Or a Snare! that you can now afford thanks to the 4 credits gain? As others have noted, the faceup install is almost a trivial downside, since Weyland rarely utilized advanced traps. A supermoderism deck running Midseason Replacements would be well-poised to capitalize on this information and the lure it provides. More bonus points if you I-A-A the agenda, then it is stolen, since you have actually gained money from the action to spend on your midseason. I for one am looking forward to trying Supermodernism again with this agenda at the helm. I'm going to say this straight-up: you do not want to have to score Oaktown Renovation. It's a 4/2 that does nothing to help your board state once you score it. No, there is a very clear use to Oaktown. You install it faceup behind a big ETR ice like Tollbooth, Hadrian's Wall, or Archer. You advance it twice, making a profit. The runner blows through a Sure Gamble or a Stimhack to pay their way in to steal it. And then you Midseason them into oblivion. Followed by judicious use of Traffic Accident to burn out Plascretes and IHWs, then Scorched Earth for the kill. Of course, the runner doesn't want this to happen. Most players are wise to tag 'n bag tricks of SEA Scorch and double Punitive, and have learned that just because they can steal an agenda, doesn't necessarily should. A wise player will let you spend all your time and money scoring that Priority Requisition, and then once they have enough money to beat a trace they will waltz in and steal the next one. Oaktown doesn't allow that. After you advance it four times, it becomes a Capital Investors, earning you a net 2 credits for every click you spend. If they don't contest this, then they will most assuredly lose the economic race, and will get buried in the tagstorm when they steal their next agenda. And, if they ever start to give it weird looks, or let you score 5 other points, then you can always just move it into your score area at the start of your turn, letting them wonder if you ever even had the Midseason in hand. Ultimately, any strategy surrounding Oaktown Renovation needs to accept that taunting the runner with a face-up agenda is a good way to get it stolen. The interesting question, then, is what advantage you can gain from such a delicious piece of bait. This card is so powerful. Simply scoring it as a 4/2 (without over-advancing it) nets you at +4 credits instead of -4. This is a ratio of +8. Imagine a 4/2 agenda that would read "when you score this agenda, gain 8 credits". Oaktown renovation is even better than that, as you can gradually net these credits in the course of advancing it. With a PAD Campaign or any other card that gives you 1 credit when your turn begins, it can be scored right after you have been siphoned to 0 credits (if advanced once the turn prior). 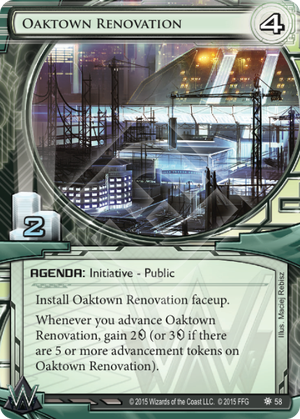 As Netrunner is a game of decision making, Oaktown gives you freedom of action. With 3 credits at the beginning of your turn, you no longer have to choose between clicking for credits to play Hedge Fund or advancing down to 0 credits to score your agenda (usually a huge tempo blow). Advancing it gives you the credits needed to red ICE and/or upgrades that protect it. After playing the agenda a fair bit i don't know what Weyland ever did without it, Oh yeah run worse 4/2's that's what. It's great click wise it's incredibly efficient install double advance nets you 2 credits, This is like 7 clicks since to end up in the same place you'd have to take 4 credits, install, double advance. On the down side the runner is 100% sure its an agenda, but your Weyland if you install advance anything they can be a good 90% sure it's an agenda this agenda just doesn't bother hiding the info they can be almost sure of anyway. It can also work into your favor after all you put a sure thing agenda in front of a runner their gonna go for it right maybe even leave them self bankrupt doing it maybe giving you a window for a bigger better to score agenda and make some money along the way. This card would be amazing if it was written a little bit differently. Unless I'm mistaken, you must use the ": Place an advancement token on an agenda." rulebook ability to trigger it. If it triggered off simply adding advancement tokens to the card (a la Trick of Light or Shipment from Kaguya), this card would be really, really tempting. I've proxied this to test it out and I'm a little confused about the design. You sort of want to fast advance it so it reaches the money-making threshold quickly, but most of the fast-advance abilities will not trigger its written benefit. Every time I drew it, I would have preferred to see Geothermal Fracking, High-Risk Investment, or even Government Contracts. I'm sure someone will figure out a way to make this card worth playing, but in my eyes, Weyland has a lot of other comparable agendas that can make it a lot more money with less risk and less investment. Just a little tip: you need at least 12 creds to fast advance and score 2/4 agenda with two Biotic Labor. Oaktown let you score it with just 7 in your wallet. Titan Transnational: Investing In Your Future loves it, even if it less secure than NAPD Contract. But at least it isn't affected from Hostile Takeover bad publicity.